Dr. Laura Hoque, right, was surprised when Barbara Van Dine told her she had never had a mammogram. AFTER a small tumor was detected in her breast last fall, Barbara Van Dine said she had two treatment choices: Traditional radiation for six or seven weeks or a new procedure completed in five days. She opted for the shorter therapy after a lumpectomy in October. The tumor was discovered during her first mammogram. "I was very much set against women having mammography because I thought squishing your breast would probably cause cancer ... so I never did have one," she said. When her family doctor asked during a physical exam last October when she had her last mammogram and she told him she'd never had one and "he just about dropped his mouth," she said. "Right then and there he made an appointment for me, which I kept. He had no inkling there would be anything wrong." She was called back for an ultrasound after her mammogram at Honolulu Medical Group. 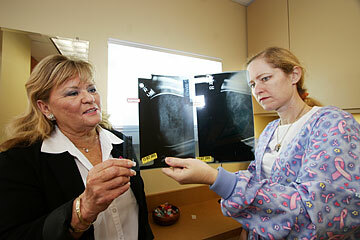 "They said definitely something was there" and referred her to Dr. Laura Hoque, she said. "That in itself scared me to death. "I had a needle biopsy and sure enough it was a very small tumor, caught in plenty of time. Dr. Hoque told me my family doctor saved my life so I took him a huge box of chocolate candy and said 'thank you for saving my life.'" Hoque, a surgeon and the medical director of the Hawaii Breast Center, described the available treatments and told Van Dine that she was a prime candidate for a new procedure called MammoSite, Van Dine recalled. Hoque said she has used MammoSite for about two years as an alternative to traditional breast radiation for certain patients and they are "just ecstatic" about it. A few other Hawaii doctors have used the therapy but Hoque said she's the only one using it regularly. The partial irradiation therapy was approved by the Federal Drug Administration in 2002 for early-stage breast cancer. The procedure involves implanting a balloon attached to a thin catheter inside the breast cavity where the tumor was removed, Hoque explained. Radiation seeds are delivered to the balloon twice a day for five days by a computer-controlled machine. "The seed that goes into the catheter stays in the breast about two minutes, then is sucked back out into the catheter," Hoque said. THE RADIATION goes only to the area where cancer is likely to recur, which limits radiation exposure to healthy tissue and reduces potential side effects, such as nausea, pain and skin irritation, Hoque said. No radioactivity remains in the breast, she said. She cited a 97 percent survival rate after five years for breast cancer when it's discovered early and treated with lumpectomy followed by radiation. "The concept before was you needed to radiate the whole breast to prevent recurrences," she said. It turned out that most recurrences are in the same area where the cancer was found, which led to the idea of radiating just the lumpectomy site, Hoque said. The major limitation to MammoSite is that the breast has to be big enough to allow a balloon, about 1 1/2 inches in diameter, to be placed there, she said. "The main downside of it is the short follow-up we have," she added, explaining the FDA approved the product based on a study of 200 women and follow-up for about three years. No patients had local recurrence of cancer in the three years, according to study results presented at an American Society for Therapeutic Radiology and Oncology meeting in October 2004. While the follow-up period is short, most localized recurrences do occur early, Hoque said. And if cancer does recur after MammoSite treatment, the breast still could be saved, she said. The procedure has great benefit for neighbor island patients, Hoque said, noting that "a lot of people have mastectomies (surgical removal of the breast) because they are geographically distant from a radiation facility, especially on Kauai." Maui has radiation services and so does Kona on the Big Island, but Hilo patients have a problem because of the distance to Kona, she said. Kauai has no radiation facility. Up to 40 percent of women on the neighbor islands who are eligible for a lumpectomy choose the more invasive mastectomy because they can't afford or tolerate nearly two months of traditional radiation taking them from their homes and jobs, Hoque said. Also, 25 percent of neighbor island women who choose lumpectomies don't receive radiation therapy as part of their treatment, even though it significantly decreases the risk of cancer recurrence, she said. THE MAMMOSITE technique would allow early-stage breast cancer patients in rural areas to get radiation since they would only have to be on Oahu five days, she said. "It is more doable." Hoque said she has done the procedure on a few Kauai women and "it worked out great." Van Dine said the balloon was inserted in her breast Jan. 5 and she had the twice-a-day treatments from Jan. 9-13 at St. Francis Medical Center-Liliha. (The Queen's Medical Center also has radiation services). "MammoSite is such a wonderful technology for myself," she said. If she had to leave her job once a day for six or seven months "it would be a real inconvenience," she said. She took a week off for the MammoSite treatments, going to St. Francis at 8 a.m., then again six hours later. "I tell you, it wasn't any fun, but compared to these gals who have to go once a day for seven weeks, it was a piece of cake." Van Dine says she's "doing wonderful" and has become a strong advocate for mammography. "I ask everyone, have you had your mammogram?